What if there was a way to make money quickly even if you had no idea whether the market would move up or down? It’s possible as long as there is sufficient price volatility. And when can you get this volatility? When news like economic data or central bank announcements is released! The first thing to consider is which news reports to trade. Earlier, we discussed the biggest moving news releases. Ideally, you would want to only trade those reports because there is a high probability the market will make a big move after their release. The next thing you should do is take a look at the range at least 20 minutes before the actual news release. The high of that range will be your upper breakout point, and the low of that range will be your lower breakout point. Note that the smaller the range is the more likely it is you will see a big move from the news report. The breakout points will be your entry levels. This is where you want to set your orders. 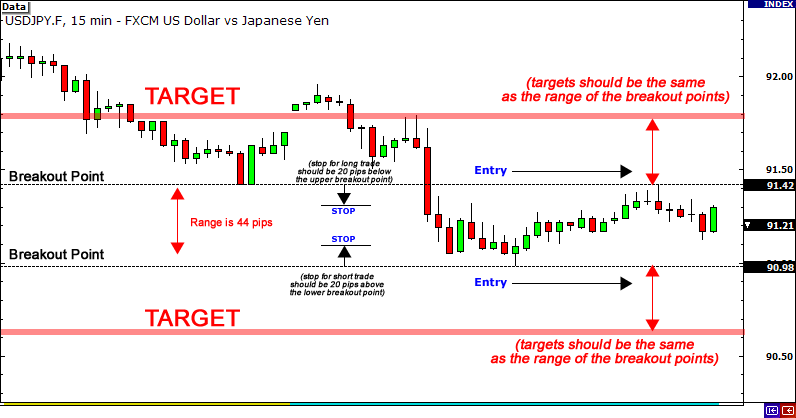 Your stops should be placed approximately 20 pips below and above the breakout points, and your initial targets should be about the same as the range of the breakout levels. This is known as a straddle trade. You are looking to play BOTH sides of the trades. It doesn’t matter which direction the price moves, the straddle strategy will have you positioned to take advantage of it. Now that you’re prepared to enter the market in either direction, all you have to do is wait for the news to come out. Sometimes you may get triggered in one direction only to find that you get stopped out because the price quickly reverses in the other direction. However, your other entry will get triggered and if that trade wins, you should recoup your initial losses and come out with a small profit. A best case scenario would be that only one of your trades gets triggered and the price continues to move in your favor so that you don’t incur any losses. Either way, if done correctly you should still end up positive for the day. One thing that makes a non-directional bias approach attractive is that it eliminates any emotions. You just want to profit when the move happens. This allows you take advantage of more trading opportunities because you will be triggered either way. There are many more strategies for trading the news, but the concepts mentioned in this lesson should always be part of your routine whenever you are working out an approach to taking advantage of news report movements.